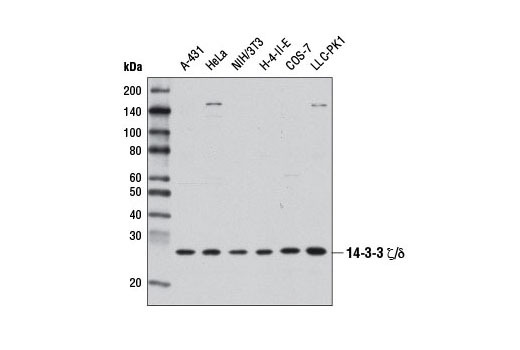 Western blot analysis of extracts from various cell lines using 14-3-3 ζ/δ (D7H5) Rabbit mAb. 14-3-3 ζ/δ (D7H5) Rabbit mAb recognizes endogenous levels of total 14-3-3 ζ/δ protein. Although this antibody demonstrates a strong preference for 14-3-3 ζ/δ, it will also detect purified, recombinant 14-3-3 α/β. It does not cross-react with any other known mammalian 14-3-3 isoforms. Monoclonal antibody is produced by immunizing animals with a synthetic peptide corresponding to residues surrounding Arg80 of human 14-3-3 ζ/δ protein.